Colour: Burnt orange, deep red, mahogany brown and more unusually yellow to lime green. Interesting Facts: A garnet in its crystal form is rounded and so its name is derived from the Latin word for grain, and, also from its similarity to the red seed of a pomegranate. Sources: Mainly Brazil, Madagascar, Zambia, Uruguay. Interesting Facts: Amethyst means ‘not drunk’ in Greek and in past times was worn as an amulet to ward off drunkenness. Colour: Mostly green but can be brown, translucent or opaque. Interesting Facts: Aquamarine is named after its sea water colour and means ‘water of the sea’ in Latin. Colour: Colourless, pale yellow, brown, black, rarely; pink, green, blue, red, orange. Sources: Australia, Botswana, Russia, South Africa, Zaire, Namibia, Brazil, Ghana. Interesting Facts: Diamond derives its name from the Greek word ‘adamas’ which means unconquerable. Colour: Light green to dark green. Interesting Facts: Emerald is named after the Greek word ‘smaragdos’ which means green stone. Colour: White, cream, golden, pink, silver, grey, black. Interesting Facts: Pearls have been used in jewellery for 6000 years and in 2500BC a large pearl trade existed in China. Colour: Pale to deep red. Interesting Facts: Named after its colour ‘ruber’ meaning red in Latin. Colour: Vibrant lime green to dark olive green. Interesting Facts: Peridot derives its name from the word ‘faridat’ which is Arabic for gem. Colour: Pale to royal blue, dark blue, colourless, pink, peach, orange, yellow, green, purple. Interesting Facts: Sapphire is named after its colour – it means blue in Greek. Colour: Milky or grey background with flashes of colours; orange, red, green, blue. ‘Fire Opal’ is bright orange. 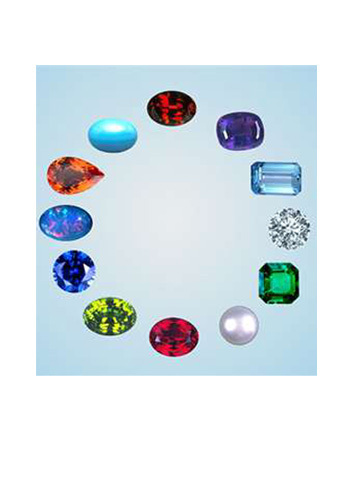 Interesting Facts: Mainly cut as cabochon stones, opal are formed from silica gel. Colour: Colourless, yellow, orange, red-brown, light to dark blue, pink. Interesting Facts: Topaz is probably named after an island in the Red Sea, formerly Topazos, now Zabargad. Colour: Sky blue to green blue. Interesting Facts: One of the first gemstones ever to be mined, some turqouise jewellery can be dated back as more than 3000 years old.